So I finally manged to get my Ace Tanker badge on my IS-3, along with my first Pools medal I had been close a few times but could never get kill no 10. 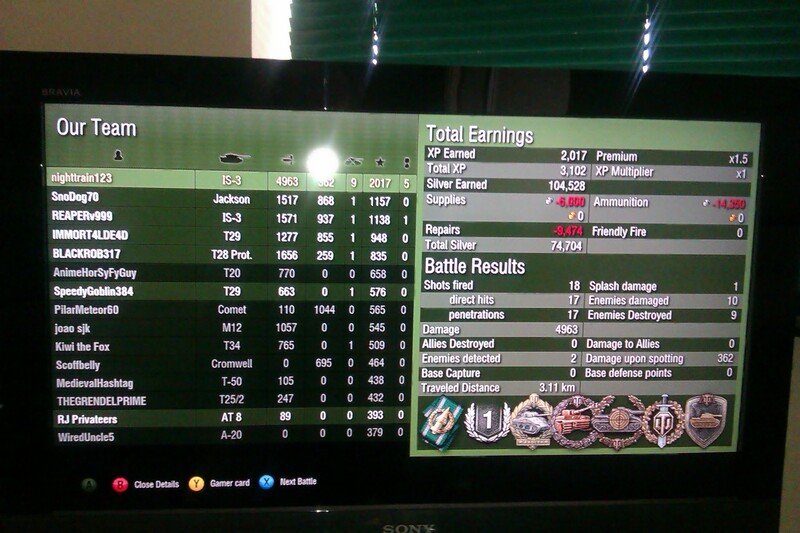 I love the IS-3 it is such an excellent tank. here is the photo evidence! I should have 7 since I got some in lower tiers but eh. I'm satisfied. Thanks guys was a fun match, on Mountain Pass, I missed out on a kolobanovs as well by 1 kill, I honestly thought I was going to miss out again, due to not being able to find their arty in time, was near our base after killing a T-29, and an AT-7 at our cap, and had 3mins30 left of game time, I found him with like 1min20 left on the clock, and for the last 5 kills I had like 225hps lol, was really tense...sweaty palms moment. Congrats!!! but really!!! you had to raise the bar for me!!!! Damn, no wonder it's so hard to get mastery. When does mastery reset every week I might attempt at getting my Ace then!!! Dude I was just one penetration less than you in this game and had to settle for the first class. I would have killed the last tank (a Tiger II) but an other IS-3 bagged it. Man that is as close as it gets, a real nice effort :) Honestly, some of these russian tanks you need an insane game to get 1st class or Ace. Top of Garage: M48 Patton - T110E3 - T110E4 - T110E5 - T57 Heavy - IS-7 - T-62A - Object 140 - E-50M - Object 268 - E-100 - FV4202 - FV215b - STB-1 Premiums: IS-6 - Pz. V/IV - T14 - SuperP - FCM36Pak40 - Liberte - Freedom - TOG II - Tetrarch - AMX Chaffee Currently grinding: AMX 13-75 - AMX 50-100 Future Grinds: ? Member of the winning team in the WG player appreciation tournament!- Generic Team Name! I thought you got 5. Weren't you in a Conqueror with 6hp left?